Mark the start of Sanibel Island’s Summer vacation season at Casa Ybel Resort this Sunday May 29 from 11:30-4:00p at Coconuts! Enjoy items like made to order burgers, St. Louis Style Pork Spare Ribs, Buttery Corn Cobbettes and more! 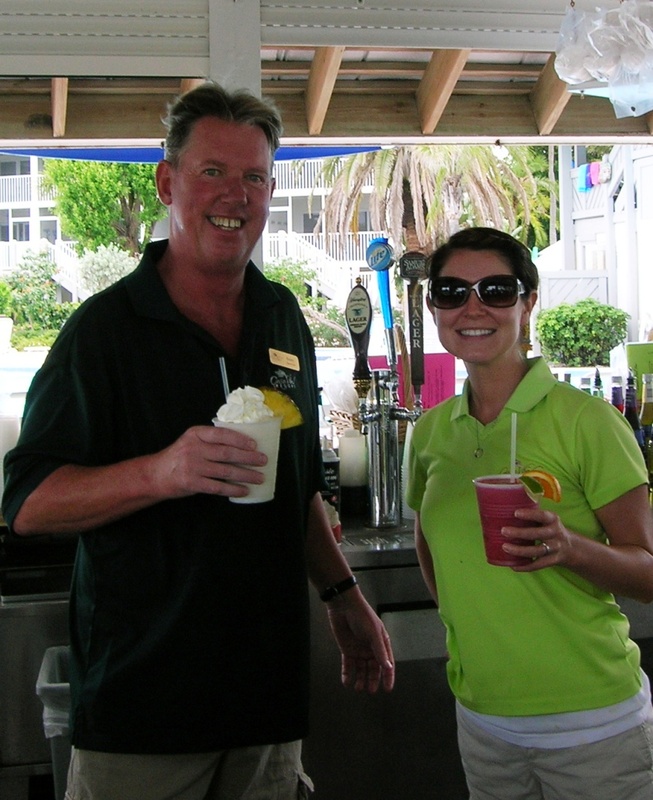 Listen to Danny Morgan and friends from 1-4pm for cool tunes while sipping on cold drinks from our Coconuts Bar! See you there. The team at Coconuts, at your service! Categories: Casa Ybel Resort, Holiday, Sanibel Island, Thistle Lodge | Permalink. 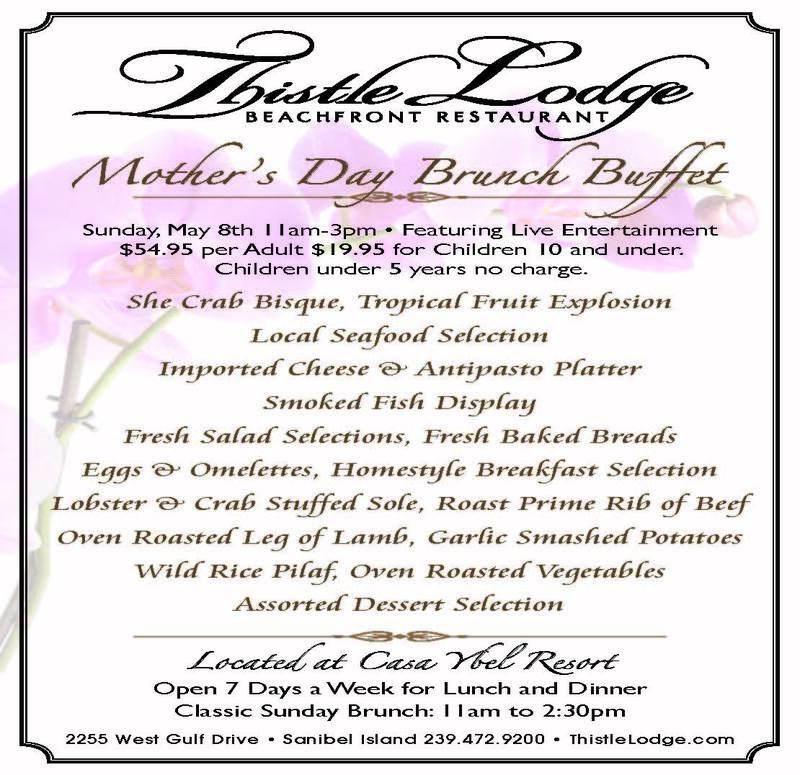 Join us at the Historic Thistle Lodge at Casa Ybel Resort on Sanibel Island for Mother’s Day Brunch! Beachfront dining and a special menu of exquisitely prepared food is guaranteed to make your holiday one you will always remember. Click the image to view our Special Holiday Menu. 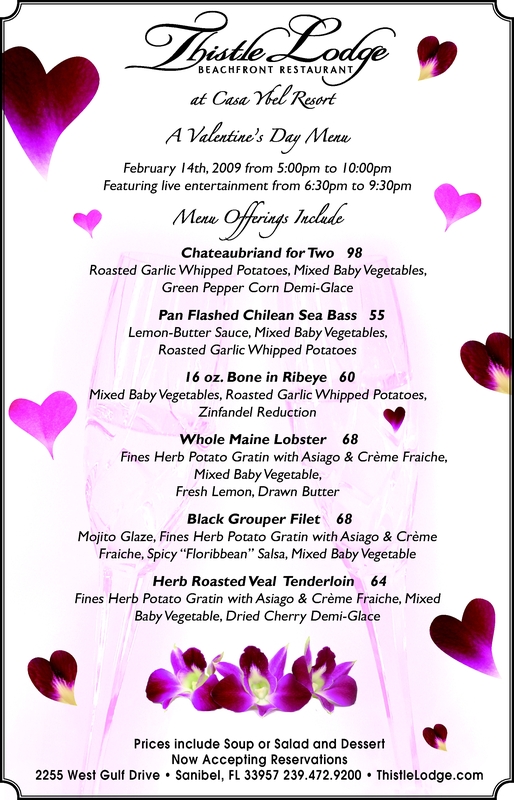 Call 239.472.9200 and Make Your Reservations Today! Categories: Casa Ybel Resort, Holiday, Thistle Lodge | Tags: Casa Ybel, Casa Ybel Resort, Easter, Thistle Lodge, Thistle Lodge Beachfront Restaurant | Permalink. Casa Ybel’s historic Thistle Lodge on Sanibel Island is accepting reservations for Valentine’s Day 2011. Dinner includes Soup or Salad and Dessert. Please call 239.472.9200 to make your reservations. You can view small sample of the special menu by clicking the image to the right. Categories: Casa Ybel Resort, Holiday, Sanibel Island, Special Event, Thistle Lodge | Tags: Casa Ybel Resort, holidays, Sanibel Island, Thistle Lodge, Thistle Lodge Beachfront Restaurant, Valentine's Day | Permalink. 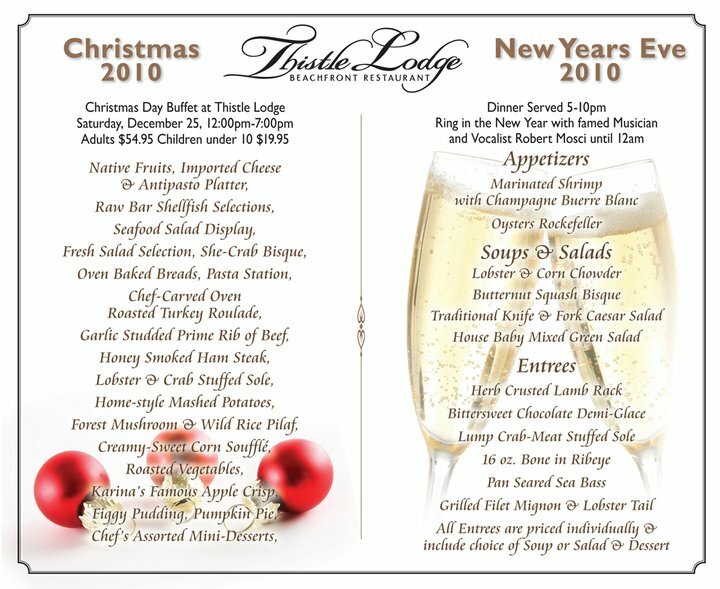 Make your reservations today to dine Christmas and New Years at award winning Thistle Lodge at Casa Ybel Resort. Thistle Lodge Christmas & New Years Menus. Please click the image to view a legible copy. Our famous Christmas Day Buffet will be served from 12p – 7:30p, and with foods that range from traditional to local favorites there is sure to be something for everyone. Join us as we ring in the New Year in elegant style! Dine on a mouth-watering array of delicious foods, including herb-crusted rack of lamb, lump crabmeat stuffed sole or grilled filet mignon and lobster tail. Famed New York singer and musician, Robert Mosci, will be providing entertainment throughout the evening. Mosci, who regularly performs at New York City’s famed Water Club has wowed audiences since he was a teen, mastering a full range of musical instruments and then adding vocals to complete the package. Categories: Casa Ybel Resort, Christmas, Holiday, New Year, Special Event, Thistle Lodge | Tags: Casa Ybel Resort, Christmas, entertainment, holidays, New Year, New Year's Eve, Robert Mosci, Thistle Lodge, Thistle Lodge Beachfront Restaurant | Permalink. Bring your love of fine food and family to Casa Ybel Resort. Now is the time to plan for your Thanksgiving Feast – This year make it Gulf Front on Sanibel Island! Casa Ybel Resort and historic Thistle Lodge on Sanibel Island is offering their traditional and popular Thanksgiving buffet! This event is open to the public. Beachfront dining and a special menu of exquisitely prepared food is guaranteed to make this holiday one you and your family will always remember. Click the image at right to view our Special Holiday Menu. Categories: Holiday, Thistle Lodge | Tags: Casa Ybel Resort, Sanibel Island, Thanksgiving, Thistle Lodge Beachfront Restaurant | Permalink. 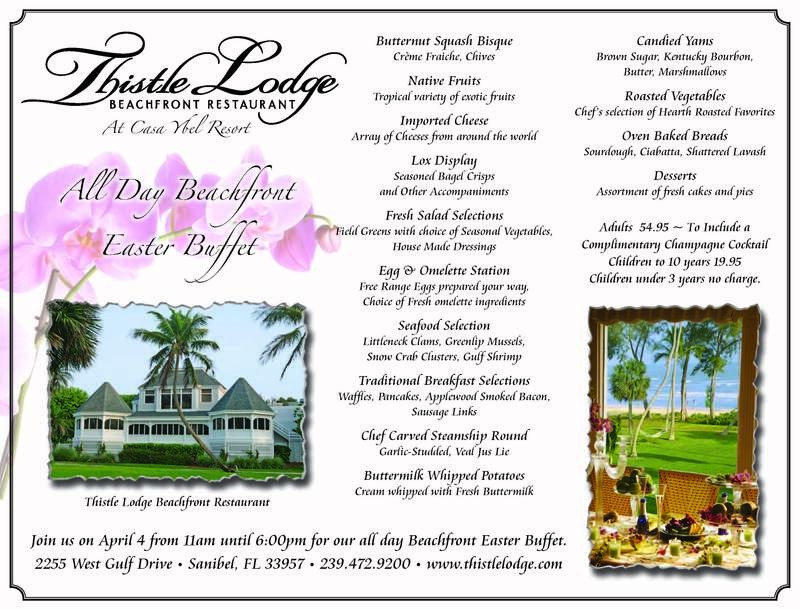 Make plans to hop over to the Historic Thistle Lodge at Casa Ybel Resort on Sanibel Island for Easter Brunch! Beachfront dining and a special menu of exquisitely prepared food is guarenteed to make your visit one you will always remember. Click the image below to view our Special Holiday Menu. Buffet will be served from 11:00am – 6:00pm. Categories: Casa Ybel Resort, Holiday, Thistle Lodge | Permalink.